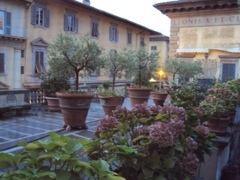 The day began with bells ringing from a nearby church, which drowned out the trash pick up from below our hotel window. 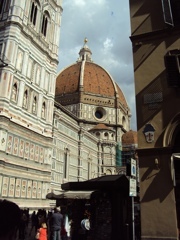 Florence is a tourists’ city, and lodging close to the Duomo is a composition of sounds of a busy metropolitan. Fortunately, it becomes white noise that didn’t hinder sleep, and was amusing. We drank a sufficient amount of strong caffe (Florentines know their coffee) and made it down to the narrow cobblestone street, where we were able to peer inside the shops that were closed when we arrived the evening before. 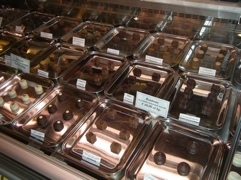 The Cioccolatiere’s beautifully arranged chocolate case brought tears to our Eva’s eyes. We looked at each other with a knowing look because there are no words. “I know,” I said. The candies were artfully and minimally arranged on silver platters with beauty and passion; something unknown to Americans where quantity dominates. 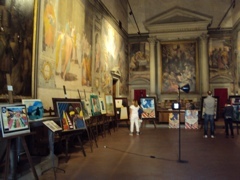 A few doors down we happened upon an artist’s exhibit in a converted church with centuries’ old frescoes. “Ohmygod” spilled out of me repeatedly (later to be my mantra for the day), as tears began to flow. The juxtaposition of the centuries-old frescoes against the contemporary cubism style of the artist was overwhelmingly beautiful and the epitome of Florence–tradition meets modern society. 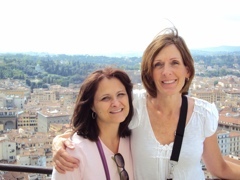 Our site seeing began with climbing the stairs of the Duomo. It is worth the many steps and narrow hallways. 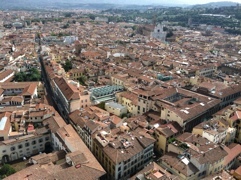 A view of clay rooftops, green hills dotted with estates, and Italy as far as the eye can see. The Ponte Vecchio was busy with jewelry stores and window shoppers. Our goal was to find a restaurant on the other side of the Arno which was recommended by our driver, however, we arrived after the lunch hour. Apparently, if you do not lunch before 2:30 p.m., you are out of luck. We did find a pizzeria, who obliged us with a very thin crust pizza with tunno, cipolla, and chianti. We took an evening stroll in search of nightcap and a night time view of the Duomo and Ponte Vecchio. The real treat was a street performer, Yuri from the Ukraine, with an accordion. A little Mozart, Bach, Vivaldi, and more tears from Eva. 30 years of friendship says, “I know” or “I get it” without a word being said. We sat quietly on a bench outside the Uffizi and then moved on to find a negroni. This is going to be me and my best friend Vikki in a few years. Fingers crossed! ← And here we go…..